It is a scenario that no parent should ever have to face: making a choice between two of your children. Michael Wagner and his wife, Johanne Wagner, have decided to leave that choice up to the doctors of their twin girls, girls that both need new livers to survive. “We told them we didn’t want to be burdened with the decision making,” Johanne told CTV News. The girls, Binh and Phuoc, were 18 months old when the Wagners adopted them from Vietnam, putting their family at nine children. They knew early on that liver problems existed, but they didn’t know the extent of their condition. As it turns out, their livers are slowly dying. They have fewer bile ducts than normal, and so less bile gets into the liver, and that disrupts fat digestion and vitamin absorption. 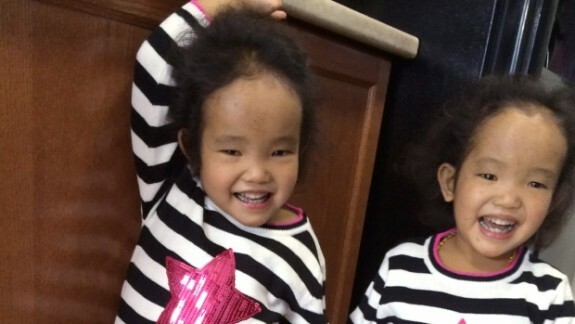 And their livers aren’t the only concern; both girls suffer from Alagille syndrome, a genetic disorder that affects their livers, hearts, and other organs. But for now, the family is trying their best to address the immediate health needs of their girls, and that starts with their father transplanting a liver into one of the girls within the next two weeks. While it won’t guarantee a long, healthy live for the twin that receives it, the one that doesn’t will certainly pass away unless a donor is found. Yet the family remains positive, and they say that, even knowing what they know now, even with the potential of a great loss, they wouldn’t have done a single thing differently.